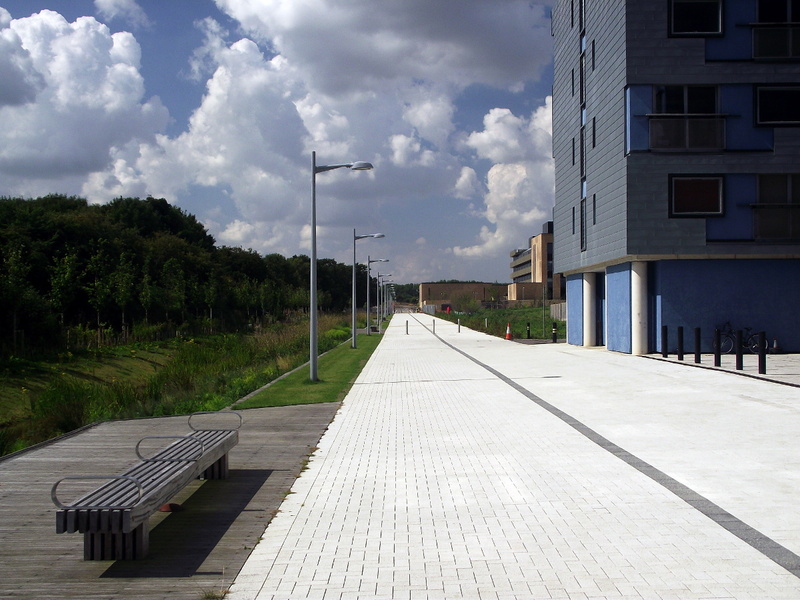 As the University’s West Cambridge site grows the primary cycle track linking it to the city centre has been extended but in a different style to the original section. Is the new section simply pretty or is it practical as well? 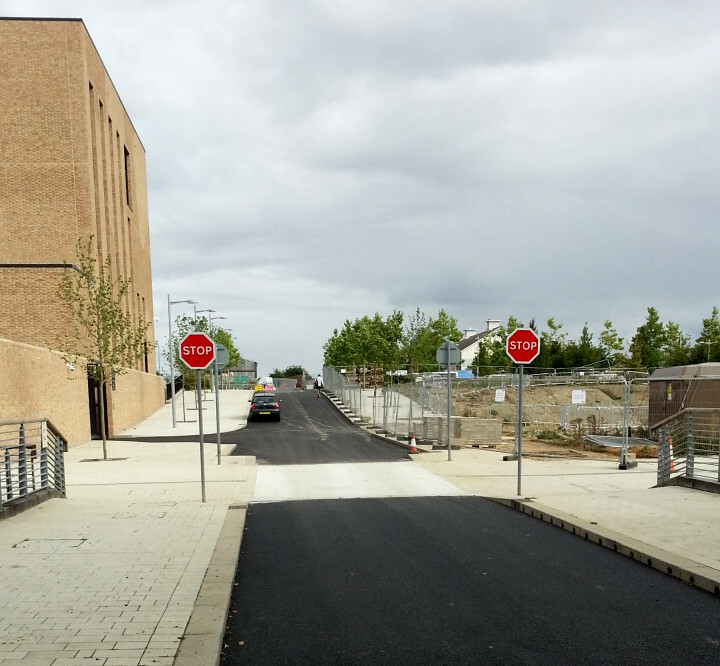 The existing cycle route to the West Cambridge site from Adams Road. It looks like a conventional road. The West Cambridge site is a university development of academic, leisure, commercial and residential uses in the area between the M11 and Wilberforce Road to the south of Madingley Road. 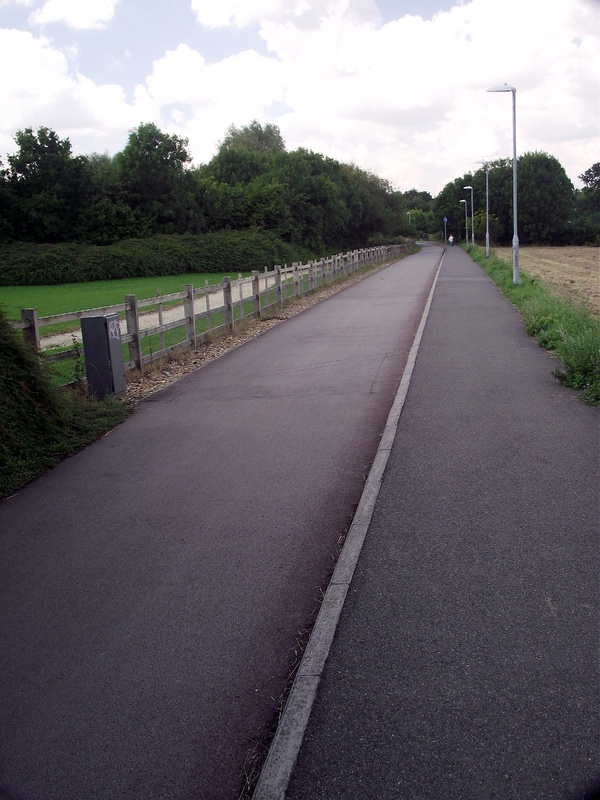 In 2006 the path that runs to Coton was upgraded to near Dutch standards with a 2m wide footway separated from a 3m cycle track with a kerb. The path is paved with smooth tarmac and lit. Although it has some issues it is probably the best quality track in Cambridge and with a clear separation between pedestrians and cyclists there seems to be no conflict. With the development now building beyond the Hauser Forum the path has been extended. The new portion is in a very different style, yes it fits in with the campus style better than the existing path (that looks like a road) but does it work as well? The junction where the route extension leaves the bridleway to Coton. This is where the design changes. The change in design is clearly seen where the extension leaves the Coton bridleway and crosses the ditch along the site’s boundary. As you can see in the picture the new section has a white block paving, with three silver bollards 1.25–1.3m apart at the far end. These bollards will be hard to see in poor light and a hazard for those with poor vision. The bridge is 5m wide with an angle that will require cyclists to slow down but it is shallower than 90°. The 7m wide extended cycle route. The route continues with a 7m wide straight section with no segregation between pedestrians and cyclists other than a gray coloured strip of paving that is flush with the surface. Both pedestrians and cyclists dislike areas like this. The bollards in the distance appear to have lights at their top. The junction of the extended cycle route and the road to the Sports Centre. 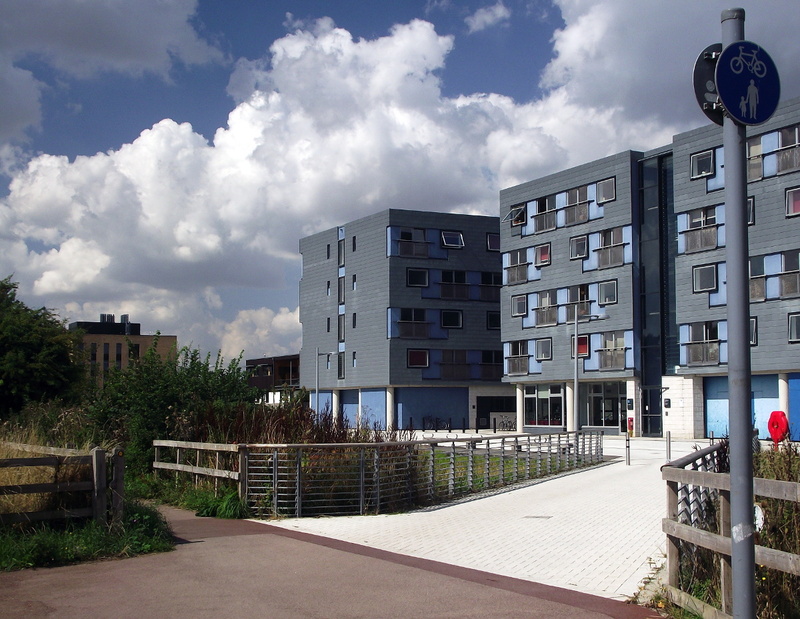 The route crosses a road that leads only to the Sports Centre, which itself has limited parking. You can see the junction in the adjacent picture. The cycle route continues on the same level and with Stop signs the priority is clearly to cyclists. However the road is also level (there is no ramp) and I am dubious how many drivers will actually stop as instructed. 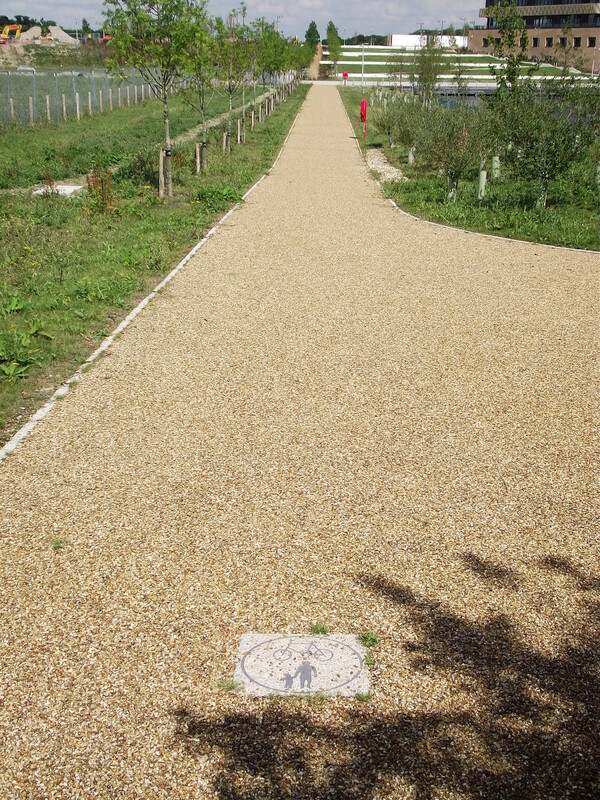 A path linking the site to the Coton bridleway with a shared use marker. The route connects to the roughly parallel Coton bridleway around the lake via this 2.9m wide shared use path constructed of bonded gravel that currently has a lot of loose material on it although this will be lost over time. There are markers in the path indicating that is is shared use; these are in a similar style to the path. I think these are too subtle and not easy to see. While I do not advocate large blue and white signs on posts everywhere I think the signs need to be clearer. The total score is: prettiness 3/4, practicality: 2/4. It’s fantastic to see a 7m wide path with minimal crossing points and interruptions, it’s disappointing that care has not been paid to the visibility of bollards and the road crossing. It’s disappointing that there isn’t a clear segregation between people walking and those cycling, is it any wonder that there are cyclists on some paths where they shouldn’t be? This entry was posted in Cycle routes and tagged Cambridge, West Cambridge by rich257. Bookmark the permalink. Is this the one that will join up with the cycle/pedestrian only route from Girton Corner into the NW Cam site? I imagine it will be. Or at least, it would make sense to. Hmm, unless you know something I don’t, I never assumed this was a through-route to Coton: I assumed the existing (albeit inadequate) path would remain, possibly even be improved. I have seen people surveying the existing path about a month ago. The paved path is for access to buildings, and therefore low design speeds is acceptable. And with 7m to play with I don’t really find there is conflict (except currently it’s much less at one point due to building works). At the junction where the design changes that you show people should be travelling slowly because of the likelihood of conflict with people travelling from the existing Coton path. I too had noted the effective priority over sports centre access, but yes, it’s not a good design. The different colour of paving continued across the entrance may help, though. I share your frustration with the ambiguity. I have no idea if the existing pavement along Charles Babbage Rd is shared use or not. There’s nothing to say that it is, but it is so ridiculously wide and people do cycle on it frequently, especially to drop off kids at the nursery. There are a number of things I think aren’t great and as I haven’t seen any planning stuff for this I assume the uni are able to do what they like. With the new development on the other side of the road and the inadequate cycle facilities on Madingley Rd I assume this is going to be a through-route to the town centre for pedestrians and cyclists. Whereas it seems to have been designed like a self-contained campus. The main good thing to be said is that there’s plenty of space to change it if necessary, but you’d lose some of that attractive paving and impact on planted trees. The path going through the site is some 200m from the Coton path that goes over the M11 so not really intended as a through route I would say, though it depends on how far the Coton path disintegrates: a longer wide fast path might be preferrable to a narrow one with wheel-catching ruts in it. I am pleased that the two are linked again at the west end. The path is shared use/shared space and although very wide there is no reassurance for people walking that they won’t have to look out for cycles coming from behind. Similarly those cycling have to be on the edge in case a walker wanders over the path while looking at their phone. A segregated path gives this reassurance. As this path could be up to 1km long I’m not sure why we should expect people cycling to have to travel at low speed and be constantly highly alert. I’ve only noticed since posting it is segregated! The black central bricks intended as dividing line. Their insistence on using those silver signs in ground is why I didn’t notice: contrast appalling and hard to see. One side has cycle sign only, as opposed to shared use signs at entrance and join next to pond. Continuing height separation would have been much clearer.